I’m constantly drawn the the luminosity of Flavin’s light fixture installations. 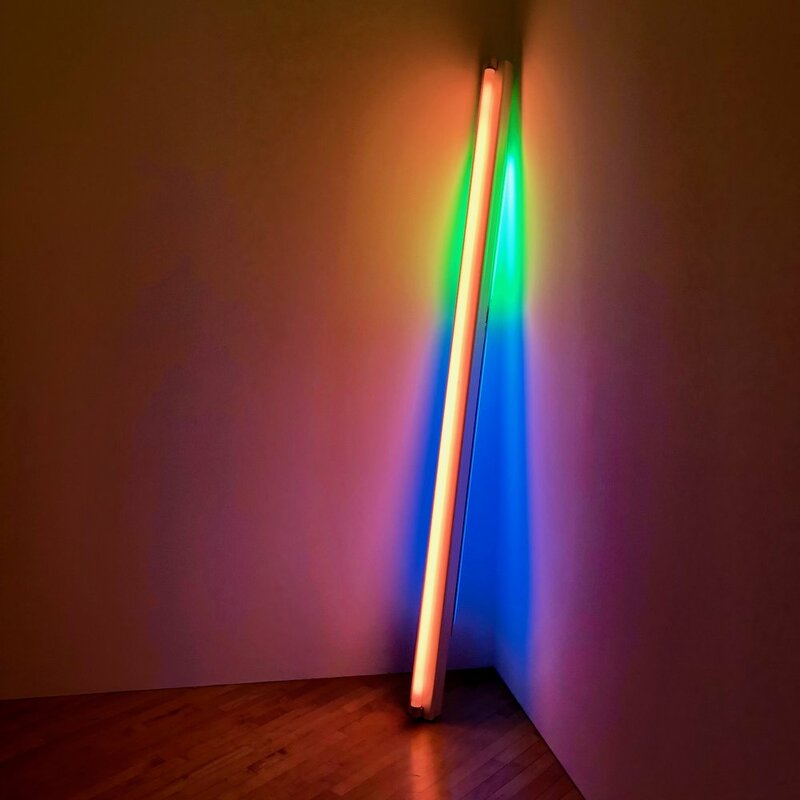 I’ve seen his work in many different spaces, but a recent trip to the Dan Flavin Art Institute in Bridgehampton was especially moving. Inspired by Elizabeth Gregory-Gruen's 'Cut Work' neutral series that I saw at this year's SPRING/BREAK Art Show during Armory Arts Week. Inspired by the Yayoi Kusama's iconic yellow and black spotted pumpkin sculpture, which she has created in different materials, sizes and environments. I saw the the free-standing fibreglass rendition while visiting the Benesse Art Site Naoshima in Japan last year and the Hirshorn Museum in Washington, D.C. currently features an infinity mirrored room of many smaller versions of this pumpkin as part of the exhibit 'Infinity Mirrors'. Raw scallop thinly sliced with pickled red pearl onions and topped with a clementine slice. Surrounded by yellow wax beans, red thai chilies and tomatoes with olive oil and Aleppo pepper. Dish Inspired by 'Count No Count' 1989 by Ross Bleckner currently on view at The Whitney Museum of Art. Last weekend I saw Swiss artist Pipilotti Rist's three-floor retrospective at the New Museum. The LED installation, 'Pixel Forest' was a dazzling sight: 3,000 handmade plastic lights hang from the ceiling and constantly change colours (each light contains a single pixel from the video that is playing on the surrounding walls). I wanted to try to capture the variety of colours I saw that day in the following dish. This salad is simple but delicate and beautiful to look at. There are so many vibrant colours that are found in nature, such as in the bright pink of the radishes and deep burgundy shade of the baby beets I used. I love beluga lentils because of their small size and ability to hold their shape after cooking. Rinse the lentils and sort through them to remove any small pebbles or twigs. In a medium pot, cover the lentils with 4 cups of cold water and set over high heat. Once the water comes to a boil, reduce the heat and simmer for about 15 minutes or until the lentils are cooked to 'firm tender'. Drain and rinse again under cold running water. Drain well and spread out on a sheet tray to help cool and dry. Meanwhile, make sure all the radishes and beets are scrubbed very well (especially the beets), as they will be eaten raw and unpeeled. Use a mandoline to cut them each into thin 1/4" slices. Depending on the natural shape of the vegetable, choose whether to cut into rounds or vertical slices (sometimes one way looks nicer than the other). To make the vinaigrette, combine the vinegar and mustard in a small bowl. While whisking, stream in the extra virgin olive oil to create an emulsion. Depending on the sharpness of the radishes, you might need more or less vinegar. Season with the celery salt and freshly ground black pepper. Toss the lentils, radishes and beets with the vinaigrette. Garnish with the carrot tops (or other greens) and gooseberries.